The C3 is selling well, Citroen says. BARCELONA -- PSA/Peugeot-Citroen wants to boost production at its factory in Trnava, Slovakia, to keep up with strong demand for the new Citroen C3 Picasso small minivan. 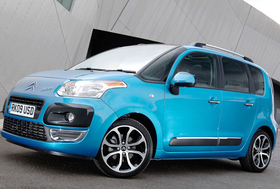 Citroen has sold 20,500 C3 Picassos since the minivan launched across Europe in March, Citroen managing director Jean-Marc Gales told Automotive News Europe. "Production today is not sufficient to keep up with demand," Gales said during an interview at the Barcelona auto show last week. "We are going to have to try to find ways to increase production at Trnava." PSA has projected annual C3 Picasso sales in the 90,000 to 110,000 range. The carmaker builds 850 cars daily at the Trnava factory, which also produces the Peugeot 207 small car.